This summer brings with it the rare opportunity to experience a comprehensive selection of the work of Auguste Rodin (1840‒1917). Auguste Rodin: The Human Experience, Selections from the Iris & B. Gerald Cantor Collections examines the eminent French sculptor’s fascination with the human figure and his lifelong effort to breathe life into bronze. 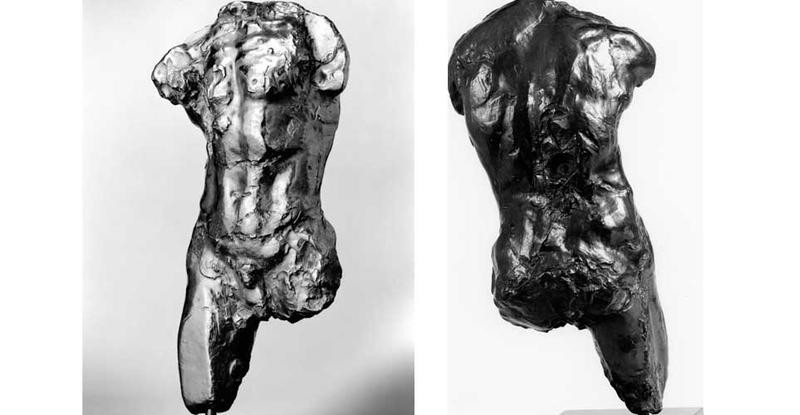 The 33 works in the show—including the iconic Meditation (with Arms), Mask of the Man with the Broken Nose, The Hand of God, Torso of the Walking Man, and The Thinker—reveal Rodin to be an artist deeply interested in sensuality, fascinated by human psychology, and obsessed with the body in motion. Rodin came from humble beginnings to win renown as one of the greatest sculptors since Michelangelo. His strength as an artist lies in his interrogation of tradition, for he liberated sculpture from the rigid academic standards that governed it to celebrate beauty and pathos as real human traits and to convey complex emotions through subtle formal relationships. He routinely deconstructed the body to allow the fragment to speak for the whole, and, in monuments like The Burghers of Calais (1884‒6), he literally took public sculpture off of its pedestal, imagining history’s heroes as ordinary human beings. His modernist approach brought him notoriety and unimaginable success, and it resulted in some of the 19th century’s most celebrated works of art. It also paved the way for significant changes in how sculpture was practiced, influencing—and at times infuriating—a new generation of artists. To accompany Auguste Rodin: The Human Experience, the museum has planned educational programs to suit a variety of interests. Lectures by Cantor Foundation Director Judith Sobol, the museum’s Curator of European and American Art Theresa Papanikolas, and the museum’s Director Stephan Jost will shed light on Rodin, his context, and his unprecedented use of photography to execute and market his work. During the show’s six-month run, look for special “Touch Tours” for the visually impaired, interdisciplinary activities for students, opportunities to sketch directly in the gallery, and yoga classes designed around ideas and themes in Rodin’s work. This exhibition has been organized by the Cantor Foundation for a national tour. The curator at the Honolulu Museum of Art is Theresa Papanikolas. Rodin transformed sculpture, but he was not an isolated genius. Sympathetic to Impressionism, resonant with Symbolism, bohemian in his proclivities, and radical in his views, he was immersed in the avant-garde circles that thrived in Paris in the closing years of the 19th century. Curator of European and American Art Theresa Papanikolas will offer a look at Rodin in the context of the French fin-de siècle to show how his work was shaped by his association with like-minded artists. To encourage longer looking and reflection, the museum offers sketch paper and drawing pencils in the Rodin exhibition. Sketch away! Then share your drawings and musings in a binder in the gallery. Offered daily for all ages. For the first time, the museum offers docent-led Touch Tours for the visually impaired. The 90-minute tours feature verbal imagining of selected sculptures in the Rodin exhibition as well in the museum’s permanent collection that participants may then explore with gloved hands. Tours are free with admission, and are limited to five visually impaired guests with their companions. Service animals are welcome. For times and sign up information, click here. Auguste Rodin is famous for the way he captured "movement" in his sculpture. To do that, he had live models walk around his studio as he sketched, so he could capture the accurate movement of the body. Auguste Rodin: The Human Experience features many sculptures that celebrate the body, and they have inspired the museum to hold a series of six yoga classes, Nov. 13 to Jan. 6, led by Heidi Hopkins of Aloha Kula Yoga in Kailua. For times and sign up information, click here. With major support from Lynne Johnson & Randy Moore and Jill & Sanford Friedman. Additional funding provided by Jean E. Rolles, Laura & Don Goo and a grant from the Hawai‘i Council for the Humanities.